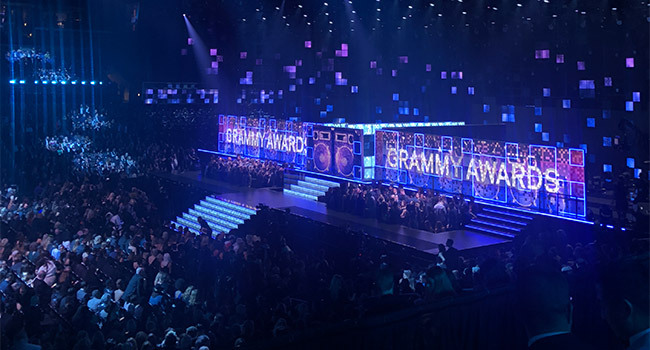 The Recording Academy hosted its 61st Annual GRAMMY Awards, held at the Staples Center in Los Angeles, CA. This year’s awards celebrated the most female artists it has in many years. Camila Cabello opened the show with a performance of her 2018 chart topper “Havana,” accompanied by J Balvin on a stage resembling the streets of Cuba. Alicia Keys hosted the evening, opening with words of encouragement from fellow female artists including Lady Gaga and Jennifer Lopez, as well as former First Lady Michelle Obama. Shawn Mendes began singing his hit “In My Blood” accompanied by Miley Cyrus. The two traded soaring vocals as the crowd cheered. Lady Gaga accepted the first award of the night on behalf of herself and Bradley Cooper for their song “Shallow.” The song is featured in the Oscar nominated motion picture, A Star is Born. Later in the show, Gaga rocked the stage in a rhinestone one piece as she belted out “Shallow” during an audience favorite performance. She was joined by Mark Ronson, as Cooper wasn’t available for appearance. Kacey Musgraves performed “Rainbow.” The song is a melody of encouragement with a reminder of not giving up, even when it may feel easiest. The country songstress stood front and center in a simple white gown with rainbow hues lighting up the stage behind her. The critically-acclaimed Musgraves won “Best Country Song” for “Space Cowboy” and “Best Country Solo Performance” for “Butterflies” before the nearly four-hour show had even begun. Musgraves also took home “Best Country Album,” and the coveted “Album of the Year” for Golden Hour, making her one of the most awarded artists of the night, with a grand total of four GRAMMYs. Keeping it country, a musical celebration honored the legendary Dolly Parton. Parton performed ten minutes of career hits, along with Kacey Musgraves, Katy Perry, Maren Morris, Little Big Town and Linda Perry. The performance also included a rendition of “Jolene,” sung with her Goddaughter, Miley Cyrus. Parton was honored two nights earlier at the 2019 MusiCares Person of the Year ceremony. Dan + Shay received a standing ovation from the audience for “Tequila,” following their first ever GRAMMY performance. Following their performance, the duo announced the the winner for “Best Rap Song.” “God’s Plan,” by Drake took home the title, and he took the stage to accept the award, despite rumors leading up to the event that he would not attend. Travis Scott performed “No Bystanders” in a theatrical performance accompanied by a group of about 50 dancers. Scott performed from inside a cage throughout the entirety of the song. Female vocalist H.E.R. invited her whole team on stage to accept the award for “Record of the Year,” which she specified is actually an EP. Brandi Carlile strummed an acoustic guitar backed by her band and a violin section her band for a stunning performance of “The Joke,” which concluded in another crowd standing ovation. The lyrics were displayed in script on a screen backdrop as Carlile sung the chorus. Cardi B won “Best Rap Album” for Invasion of Privacy. The rapper joked, “Maybe I need to start smoking weed” after telling her husband, Offset — who was holding her hand on stage — that she couldn’t breathe. Dua Lipa snagged “Best New Artist,” following her performance with St. Vincent. “I’m proof that you can do whatever you put your mind to,” she said. Gloria Ruth Finney is a Music Journalist based in Nashville, TN. She uses her experience as a multimedia journalist and on-air reporter to produce creative content by combining her passions for music and news.